Hypothetical areas on a Ulithi island. Adapted from Descantes (1998), with information from Mariano. 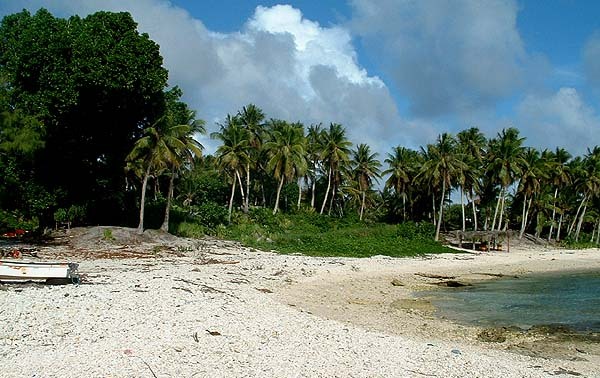 “The islands of Ulithi are almost all alike, in terms of land zones," Mariano says, "except for Falalop—the Mainland—where it’s considered to have more soil instead of sand. These islands, if you’re looking at a cross-section view, it would be like a low volcano, where the edge or sides of the island are somewhat higher. The middle of the island is usually lower than the sides. "Generally speaking, we have rocky areas, we have wet areas, and we have sandy areas. These are found in that order, from the windward to the leeward side." " And then we have places we can call ‘wet areas.’ In this case, that’s usually in the middle of the island." "On the windward side, first you have rocks. Purely rocks. You have no soil. Rocky areas, some areas are entirely just rocks. 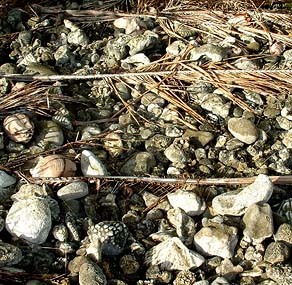 But in some areas rocks are mixed with gravel and sand. "If you find rocky areas in the middle of the island, you know it’s not naturally there. It was moved or used as a landfill by the military. Naturally, a rocky area on an island is usually the windward side. The windward side, it’s always windy and so it always has surf. And the waves break the coral and they pile in the rocks to form up the shore, the rocky shore of each island. "On some islands, the windward side, rocks can reach through to the next zone. As you go toward the middle of the island, you go from pure rocks, to rocks mixed with sand or a little bit of soil—'black sand,' because that’s all the soil. Not volcanic black sand." Edge of a taro patch on Mogmog. The dark sandy soil is enhanced by the application of dead leaves and other organic material. "Then it can be the swamp, or wet land, in the middle of the island. That has to do with long periods of time, when it rains, and the water runs toward the middle of the island. You will find on these islands that it’s usually in the middle of the island; or on some islands, close to one side, but usually in the middle area of each island. “That’s where we usually grow taro which we call 'swamp taro.' It’s not really muddy, as it would be in a swamp area, because the soil on these islands is not thick, so when we make taro patches in the wet areas, we add to the soil—we put dead leaves, and wood that can rot away. So we help the soil by adding to it. And that’s how we get our taro patches. The sandy leeward - lagoon side of Falalop. "The leeward side of the island, this is a beach area. It is the sandy side, because it’s facing the lagoon and the water is calmer. You have beach, your have gravel, sometimes mixed sand-gravel. But usually it goes water—sand—gravel. Some places it’s just water and purely sand all through these zones from the leeward side. Then into our black sand, and the wetland. So that’s the difference between the windward and leeward sides." "In the sandy areas on these islands, we usually grow coconuts. Coconuts can be grown anywhere—sandy areas, wet areas, or rocky areas. But some particular crops, for instance the wild land taro, it can be grown in the wet areas, alongside the taro patches, as well as in rocky places. It grows very well. "People say it tastes good if it’s grown in rocky areas—why, I don’t know, but I’ve tasted it and there is a difference. It doesn’t grow very well in sandy areas. 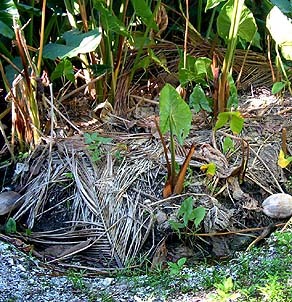 So wild, dry-land taro can be grown in wet areas as well as in rocky areas. "There some plants that do not grown well in the wet areas. But they grow well all along the shore, in sandy or rocky areas. 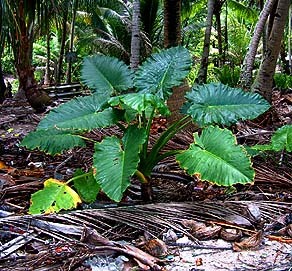 This very healthy-looking dryland taro is growing in a sandy-rocky area on Mogmog. 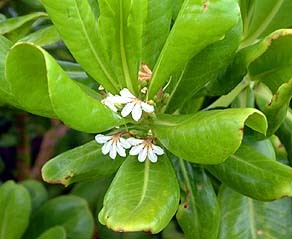 Ll'ad , a common beach plant, has medicinal uses. "One of our medicines, ll'ad, is an example. If it’s grown in the wet lands, it can grow to be a very big, very tall tree. It grows faster and bigger in the wet areas. But you can tell that the trunk, even though it gets bigger, it still looks more like greenish; it looks younger than those that would have grown in the rocky and sandy areas. I guess it needs just so much water and not too much. "People here would choose the ll'ad along the shore to take their medicine from, rather than this greenish one in the middle of the island." 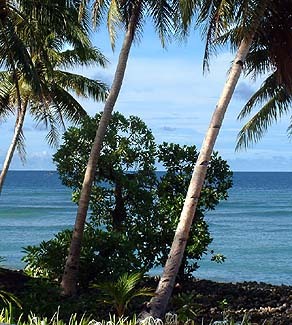 "Pandanus is found most commonly along the windward side of each island—the rocky side. There are some Pandanus that grow along the beach areas. But storms usually wipe them away, because the sand is soft. 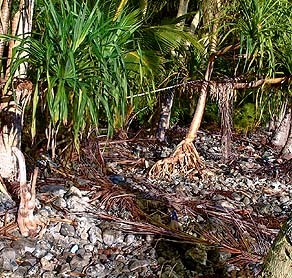 Even though a Pandanus so many roots, it’s not like on the windward side, where the roots can hold on to the rocks. "Cchel', a tree that looks similar to ll'ad , can be found in both sides, all the shores of each island. You will seldom find that Cchel' grown in the middle of an island. And when you find Cchel' trees grown in the middle of the island, it usually the sandy islands. For example, you can find Cchel' in the middle of Fedraey island. But you will seldom find a Cchel' growing in the middle Falalop island." Pandanus growing in the rocky area. "On the islands are different name of places," Isaac Langal says. "This place where I am sitting at right now is called Faaelmwog. And just over there is a different name, and a little bit further is a different name. Faaelmwog over here, and Wolharah down here, and Hapliim over there, and Faaelmeamwool over there. These are not square,they are different shapes. "There’s probably 40 or 50 different land parcels that have names, here on Asor. On other the island, there are different names, but some names are the same. We have that place of that name here and we have the same name on Falalop, same name Fedraey, same name on Mogmog." “Some are descriptive names. Like here, this Faaelmwog, this means underneath some kind of tree. That kind of tree is very rare now. There’s some that are still alive, but that’s on the other end of the island, and it’s very rare. The name of that tree is Mwog and faaelmwog means underneath that tree. That’s the name of this piece of land here, that I inherited from my father. “These names are linked to clans. When someone gives the name of a piece land, then you know what ranking that place has on the island, who that particular piece of land belongs to. Just by the name." Cchel' growing by the sea on Falalop. 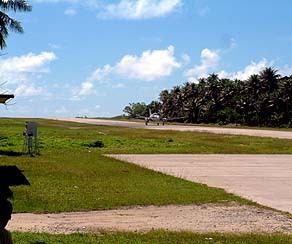 The runway covers most of the taro patch, but the land to the left is part of the Hapilbol area. “There are names for each house platform," Mariano continues. "Now for bigger clans there’s a name that covers several house platforms. Same thing if you go out into the woods: you have a particular name for an area of land. And there are several parcels in that area. "For example, on the High School side of Falalop it’s called hapilbol. meaning hapil—‘the back of’—and bol is the taro patch. So all that Hapilbol area, it’s ‘in the back of the taro patch’ area. That was a big taro patch area. Then they put the runway in the center of it, so just a few taro patches remain along side the runway. “There are pieces of lands with different names in that same Hapilbol area. They are owned by different people. A single patch to belong to this person. It can be owned by the same clan. And it can, the smaller parcels, can be owned by separate people, different people." “Now the clan owns this whole area. Mostly, members of the clans, they divide up the land. Let’s say I own this parcel because I am a member of the clan. Now you may own that parcel, still within this whole area, because of a service that you gave to the clan. "And so as a member of the clan, I’m told this, and this knowledge is passed down from father to son: that land belongs to that man, and he will never be removed from that parcel, because of this service that was given to the great, great, great grandfather. “If there were only two of us, brothers, when we’re young, we farm this one piece of land. Now, we grow up: you have a family, I have a family, then our father can split the land in half. That’s how we get these smaller parcels within a larger parcel. "And not only on dry lands, but in the taro patch also. This whole taro patch area is owned by this clan. Now it is divided up into smaller patches. And it’s divided so each person tends to a particular, smaller piece." The lines on this map give a sense of the land division pattern on Mogmog. The hole in the middle is the swamp-taro area. 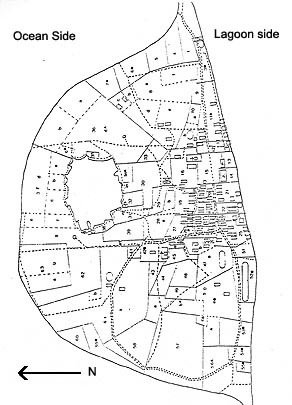 Map from Ushijima (1982). The naming of children here gets connected to land inheritance. Click here to learn more about family names on Ulithi. Next, Steve and Mariano explain the nature of winds in Ulithi and in the Outer Islands of Yap.